Sultanpur Bird Sanctuary or Sultanpur National Park in located in Gurgaon (Gurugram) district on Farukhnagar Road. 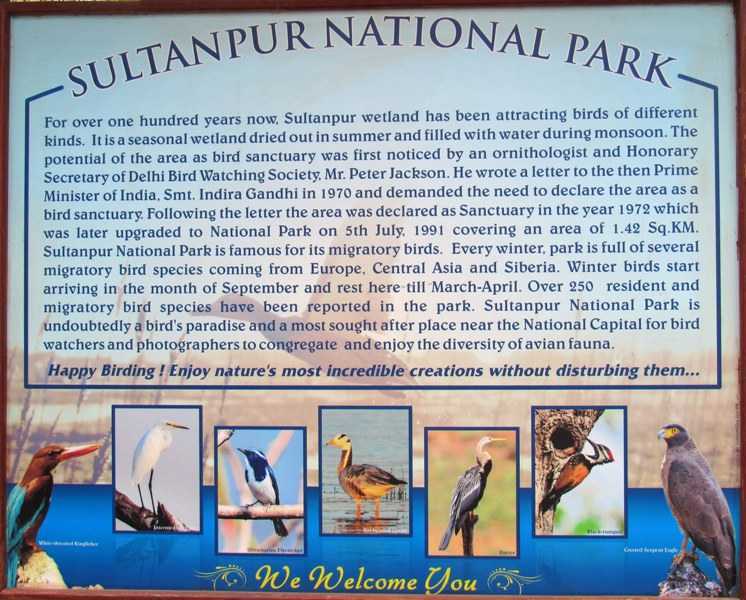 Sultanpur got its status of a national park in the year 1989 after 17 years when it was declared as a bird sanctuary in 1972. The total area of the park is 1.43 square KM. A big lake in the middle of the park is the main habitat of birds. 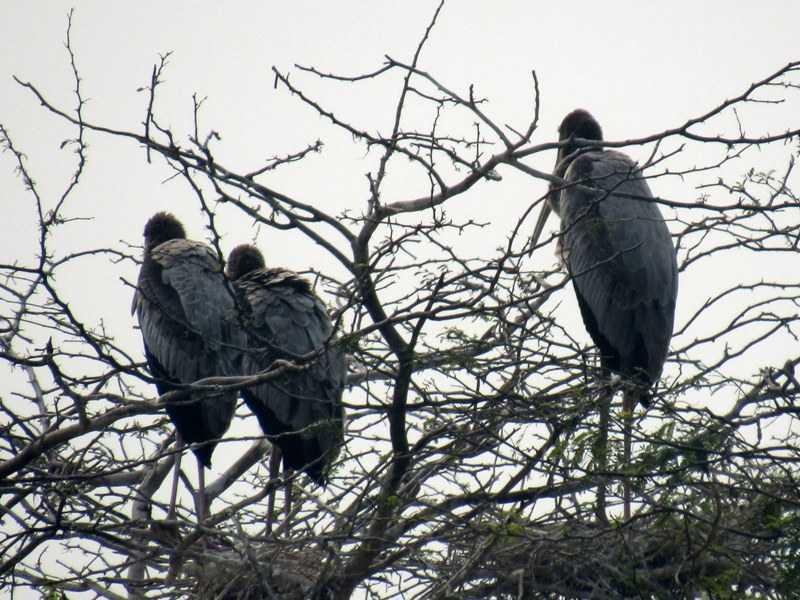 The Sultanpur lake has multiple small islands where the birds made their nest in the trees. The park is the home of migratory bird which flew from all over the Asia and Europe. 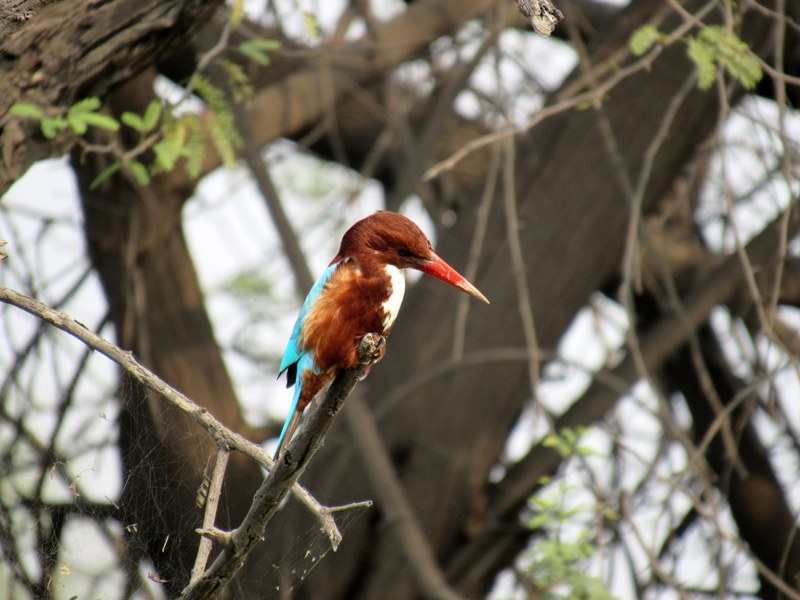 If you are a bird lover, want to trail in the nature and spend some quality time in the nature then this is the best place in Delhi NCR for you. 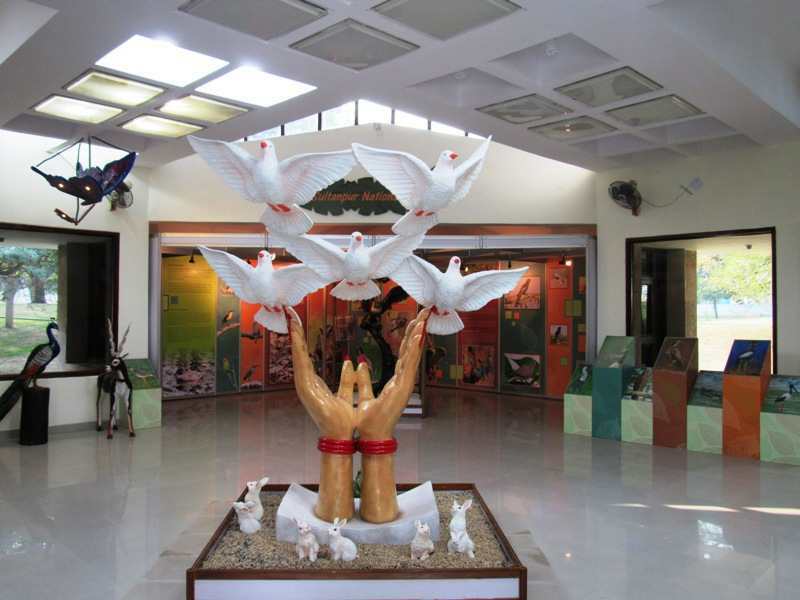 Total are of national park is 352 acres and nature trail is 3.5 KM long. Area of Sultanpur lake is 150 acres. Sultanpur Bird Sanctuary Timing is 7.00 to 4.30 PM. Entry Timing is 7 AM, however, you can enter the park at 6 AM in the morning after obtaining the written permission from the Divisional Wildlife Officer’s Office in advance. You must leave the park before sunset. 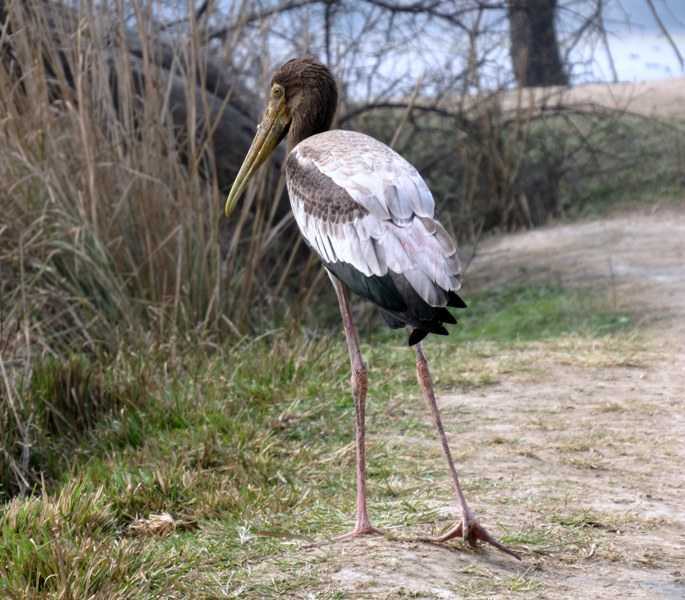 Best season to visit Sultanpur National Park is in the winter season (December to February). The Best time to visit the park is at the time of Sunrise when the maximum number of birds can be seen in the park or in the sky. It remains closed on Every Tuesday. 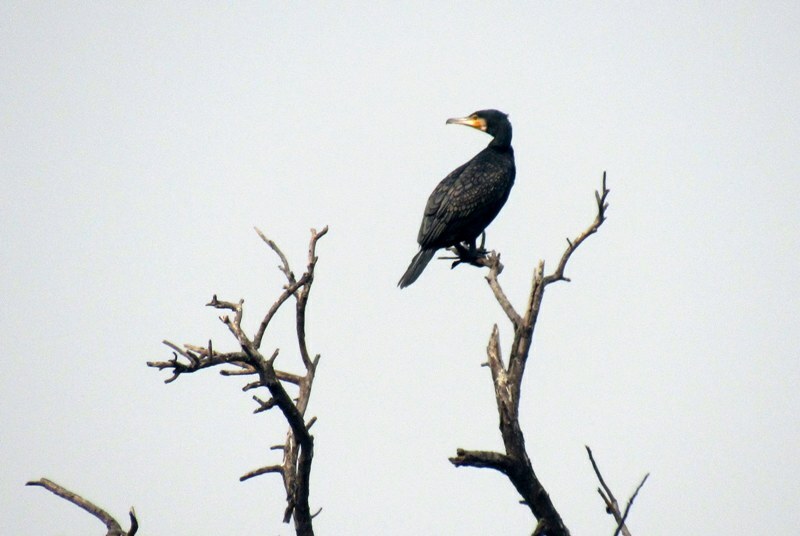 The heavy fog in the winter season can disappoint you and break your dream of bird watching in the early morning. Minimum 2 to 3 hours are required to cover the park, if you are a true bird lover then the whole day is insufficient for you. 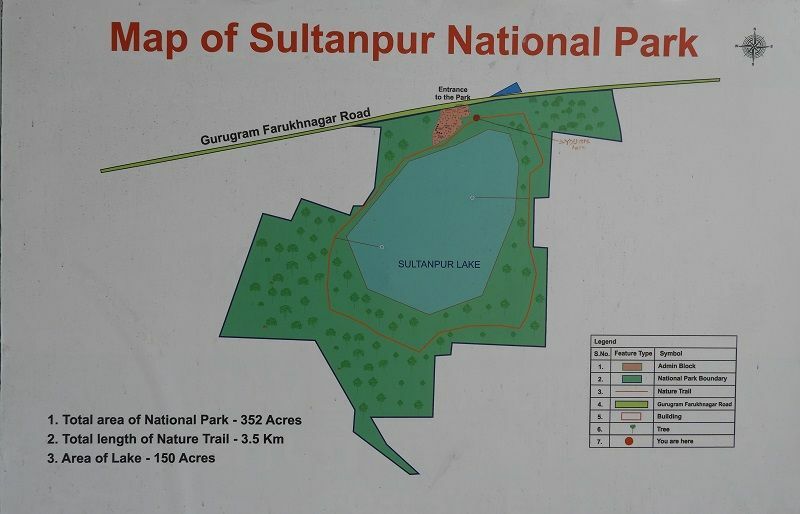 There is a circular path around the Sultanpur lake which can be visited to watch a variety of birds, however, half of the circular path was closed during our visit in February 2016. 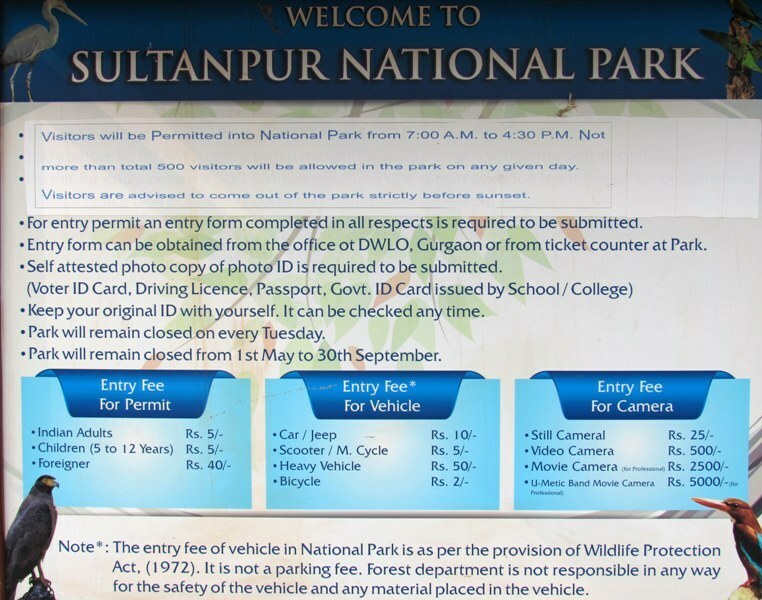 Sultanpur Sanctuary remains closed from May to September Every Year. It opens in the month of October to April. Sultanpur Bird Sanctuary ticket price is 5 Rs. and digital camera charge is 25 rs. Parking charge for four wheeler is 10 and two wheeler is 5 rs. Only. Foreign travelers have to pay 40 rs for the entry. It is 40 KM away from Dhaula Kuan, and 50 Km from New Delhi. It is 14 km away from the Gurgaon Bus stand and Railway Station. Visitors can reach here via bused running Gurgaon Farukh Nagar Road. Public transport facility is not good in this area. Best way to reach here via own vehicle. A hall near the entry gate of Sultanpur sanctuary, dedicated to Dr. Salim Ali where his research, photographs, write up are kept there. An newly built interpretation center is also in the sanctuary where interactive route map of migratory birds displayed on the wall. Information about different birds also displayed on the wall along with their habitats, route, migration reason, food choice, etc. A electronic board with multiple switches can be used to listen recorded chirping of birds. The interpretation hall is very informative and kids will love this. The National park has a parking space which can accommodate around 40-50 vehicle, which feels small on the weekends or holidays, I saw many vehicles parked on the road due to lack of space. Wash room and drinking water facility are available in the park. Food is not allowed in the national park premises; however, you can enjoy the food in the small park adjacent to the boundary of the bird sanctuary. There are four watch towers in the park, out of four towers three were closed during our visit. Only one watch tower near the entry gate is open for visitors. View from the watch tower is good and it can occupy maximum 5 to 6 people, stairs of watch towers are too steep, so kindly take precaution while climbing the towers. A small shop besides the ticket counter owned by forest department sells water bottles and animal statues. There is no food facility in the campus of the Park. Some street vendors selling snacks and other eatables outside the gate of the park, so make your plan accordingly. There are some good and hygienic restaurants are in the radius of 1 to 2 KM like Village Dhaba and OM Dhaba. We took our lunch in the Village Dhaba, the food quality is good and total cost for 4 persons is around 600 including 3 sweet curd lassi. The bird sanctuary located remotely from the city so make your food arrangement accordingly, food is not allowed inside the park. If you are going with the kids, keep them with you. Keep yourself side from hedges and brambles. Do not try to go into the lake. Always wear full clothes which cover your body and wear good quality comfortable shoes. Keep your valuable items safe from the monkeys of the park. Take extra precautions while climbing the watch tower. 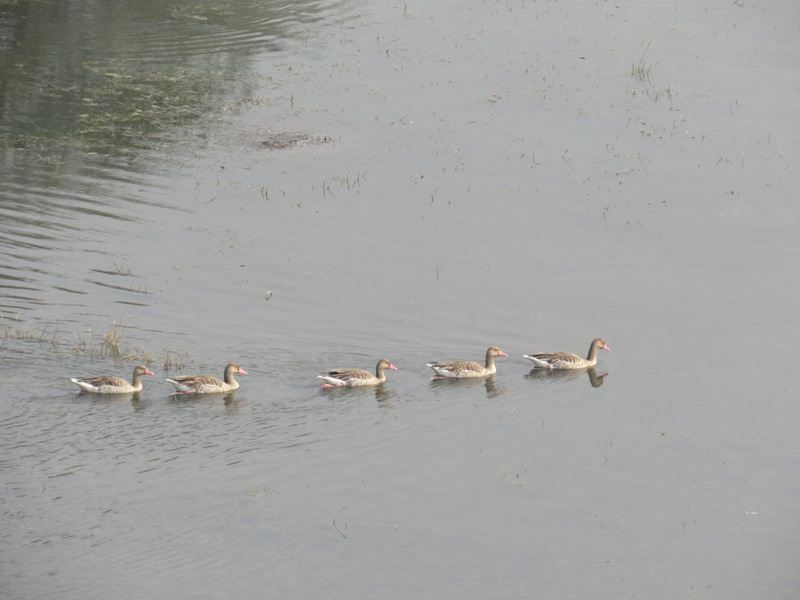 We saw many birds on our visit of Sultanpur sanctuary in the month of February. 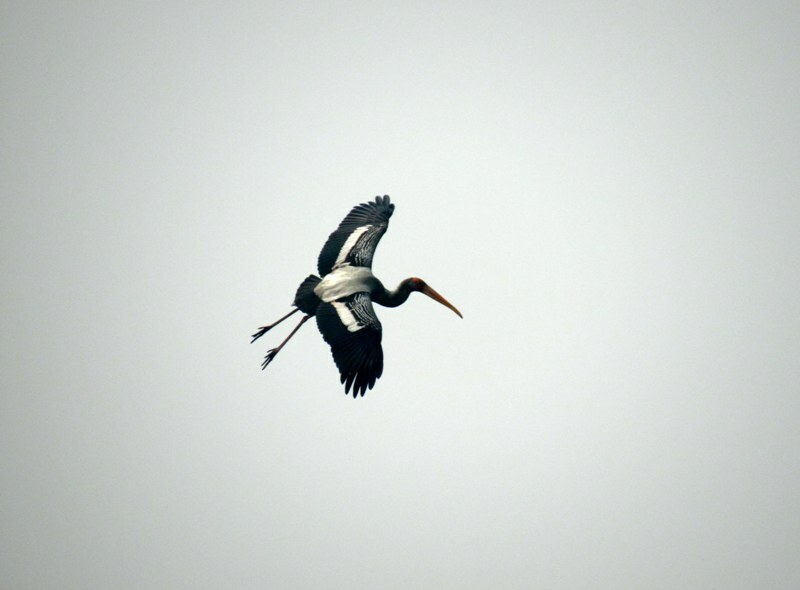 We spotted the white throated kingfisher, Siberian crane, Red-wattled lapwing, Sarus crane, Northern pintail, Painted stork, etc. Sultanpur Bird sanctuary is the home of many migratory and resident birds, however I saw many birds at the park but I don’t know the name of every bird. It was a pleasurable experience to watch many birds at a single place. Apart from the birds you can spot Nilgai in the park along with street cows and bulls. 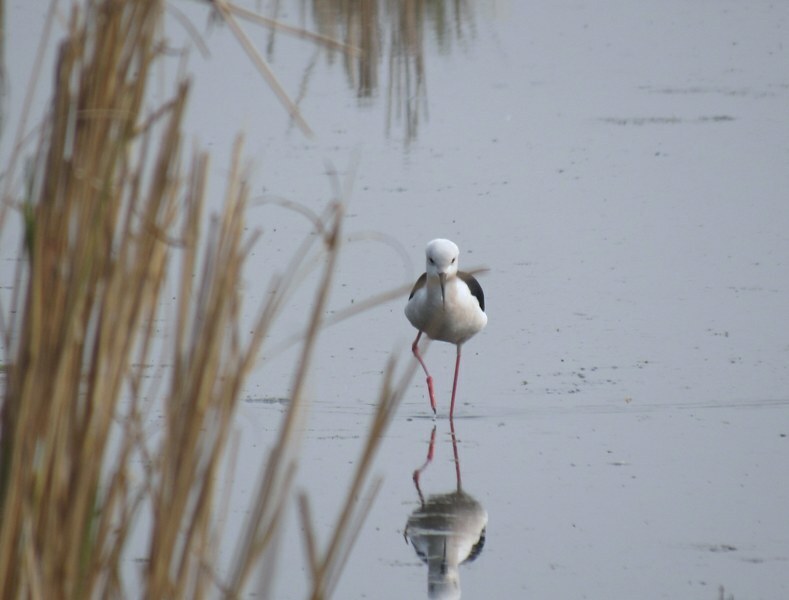 I hope you like the Sultanpur Bird Sanctuary Pictures. All pictures clicked by our team during our visit to the park. Tip: Wear comfortable shoes, carry good quality digital camera or DSLR and binoculars for bird watching.